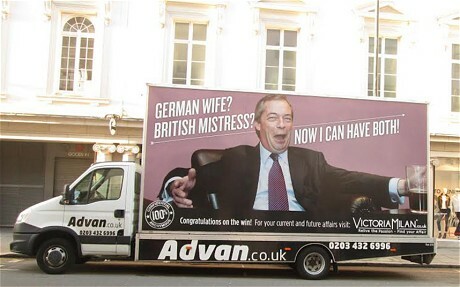 Nigel Farage is making headlines for a different reason this week, thanks to Europe’s most popular infidelity website and Advan.co.uk. Victoria Milan has enlisted the help of Advan.co.uk to launch a promotional mobile advertising campaign in London, featuring an image of the Ukip leader. The traditional Advan is being driven across the capital bearing a picture of a beaming Nigel Farage holding a pint of beer. Accompanied by the headline, “German wife? British mistress? Now I can have both”, the campaign is being used to promote Victoria Milan – a dating website for men and women already in relationships. The site claims to have over four million world-wide members. The striking Farage Advan was unveiled this week outside Ukip’s offices and will run for several weeks, maximising impact by targeting London’s most popular areas. The Advan has already received coverage from national press, and will undoubtedly continue to get people talking throughout the coming weeks.